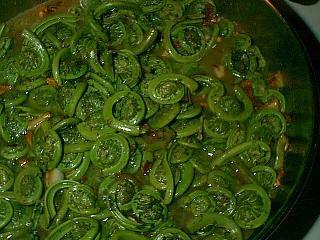 Spring is the time of year for some special seasonal dishes here in the Northeast. Along with Shad Roe, fiddleheads mark the end of spring and beginning of summer. 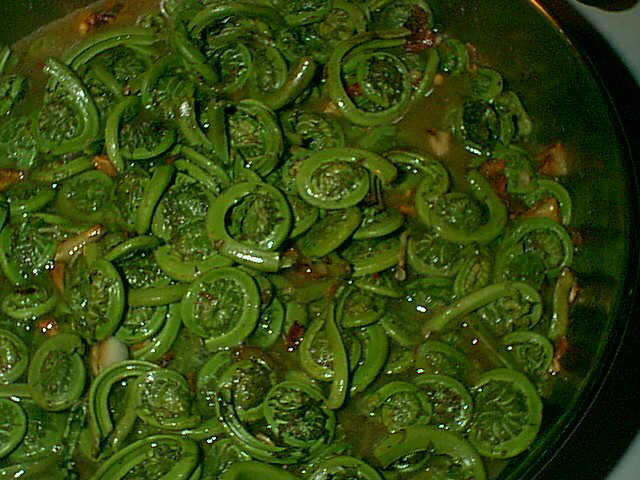 Fiddleheads are the immature sprouts of the matteucia family of ferns, consisting mainly of ostrich and wood ferns. 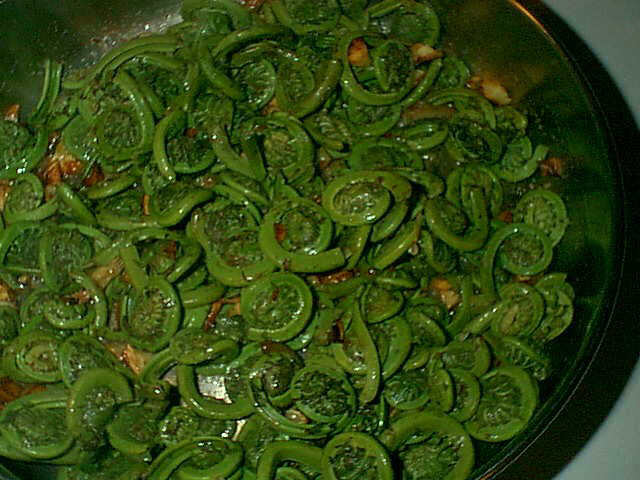 Here in Connecticut, fiddleheads can be gathered wild along the banks of the Connecticut River. I have yet to see any along the Five-Mile River. 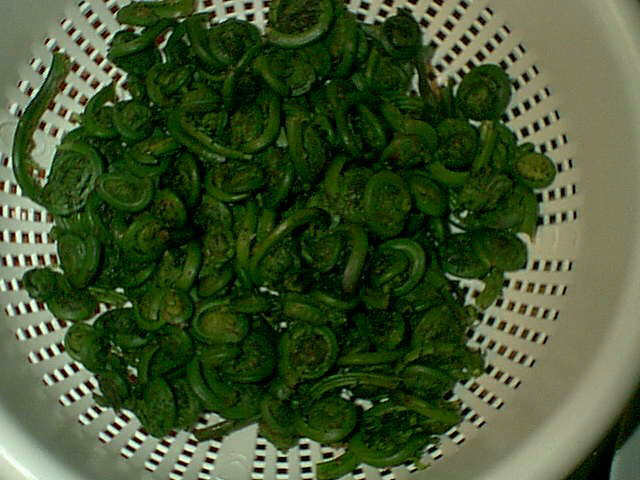 They're available now in supermarkets for around $3.00 per pound. 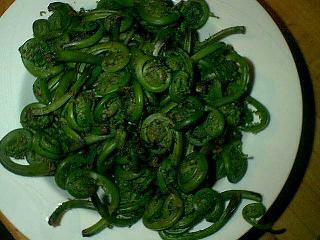 They taste like a cross between asparagus and string beans to me. Apparently you can Grow them at home, but most come from commercial farms. 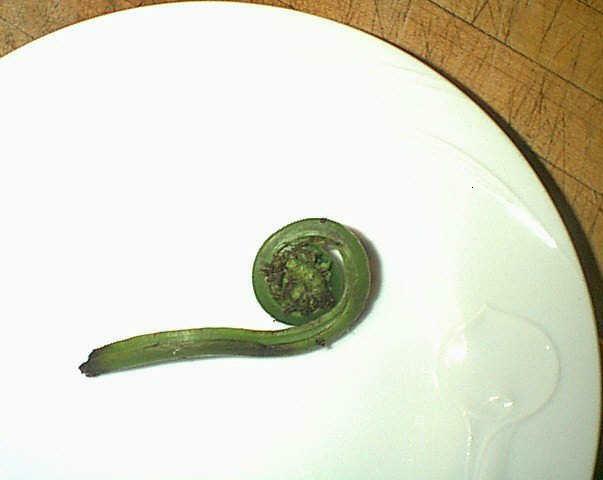 Learn more about fiddleheads and other ferns from The American Fern Society. This is another Danger Kitchen original recipe. 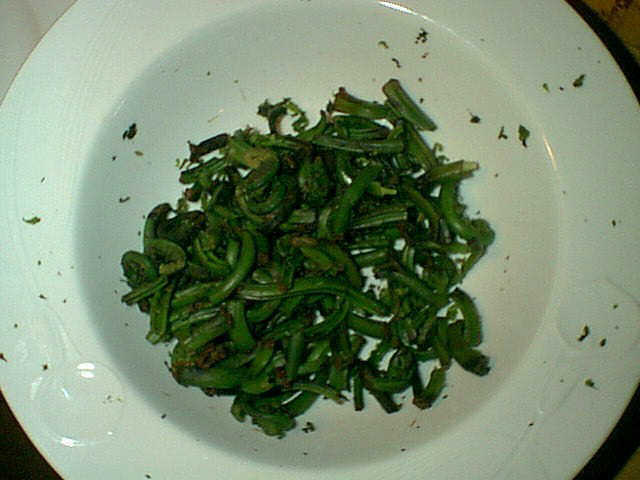 > 1 pound fiddleheads, cleaned (see below). > 1 to 15 cloves of garlic. > 1/3 cup seasoned bread crumbs. > Freshly grated parmesan cheese. > Crumbled crisp fried bacon. > Steam the fiddles in 1/2 inch of water on hight for 5 minutes or so. 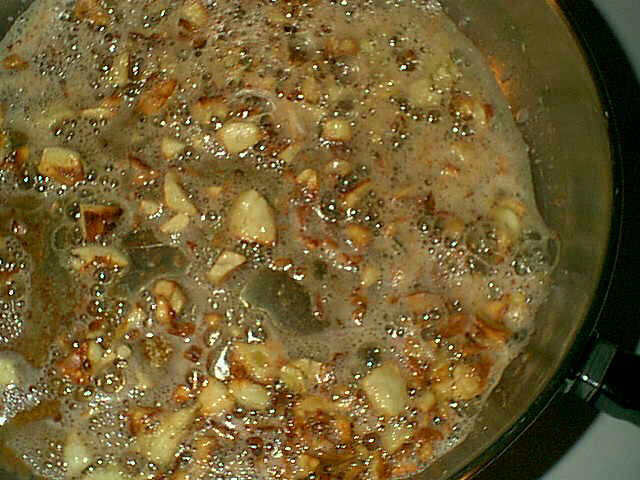 > Saute the garlic in melted butter slowly until beginning to brown. 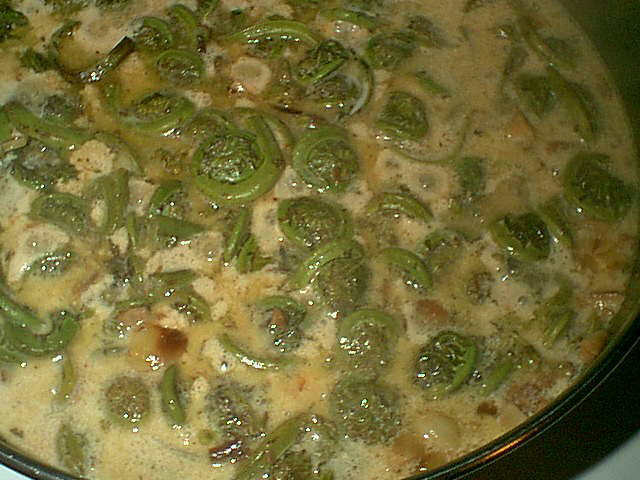 > Drain the fiddleheads and add to the pan with butter and garlic. > Stir to mix thoroughly. 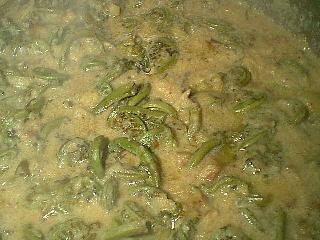 > Add 1 cup of white wine, cover and braise for five minutes, until fiddles are tender. > Turn down the heat and add the cream, stirring to coat. > Grind in just a little black pepper. > Cover to keep warm until serving. > Add bread crumbs and stir to thicken. Add more cream if necessary. > Add brumbled crisp fried bacon. > Add parsley with double the wine and omit the bread crumbs for a pasta sauce. > Add greshly grated parmesan cheese if desired. 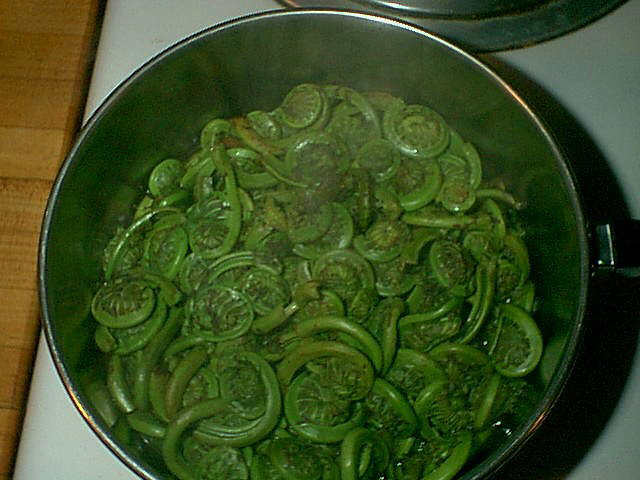 > Chop the fiddleheads for a sauce, rather than leave whole. > Serve as a sauce with chicken, fish, turkey or pork. > Mix with cheese and cooked macaroni and bake until brown on top. > Serve over baked potatoes. > Cool after braising, add beaten eggs to the cream, mix and bake like a quiche. This is what a pound of fresh fiddleheads looks like, from the supermarket, or picked in the wild. The results look the same although fresh picked is better of course. Here's one good specimen cut from the herd. The best size is two inches or less from end to end, dark jade green in color, and very little discoloration on the cut end of the stem. 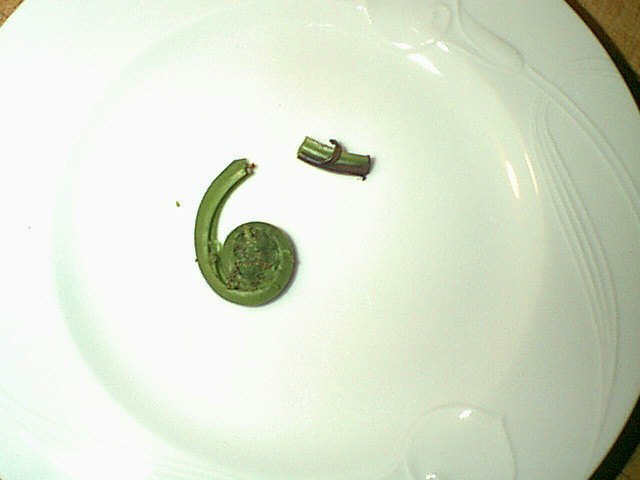 To prepare them, the first order of business is to snap the stem ends off like you would asparagus or green beans. This can be tedious, but it's worth it. This is how much scrap is left from a pound of fiddles. They can be a bit messy. The dark colored specs are seeds and papery husk sorts of things that clink to the inside of the curled up leaves. Don't worry too much about them yet. 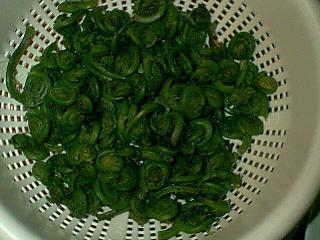 Put the fiddles in a colander and shake them back and forth vigorously while running them under warm water. This washes them and removes the seeds and other debris. Try not the sweat the muddy green color of the water coming off them. It looks pretty nasty. Put the fiddles in a pan with a half inch of water and steam over high heat for about five minutes or so, until just beginning to get tender. 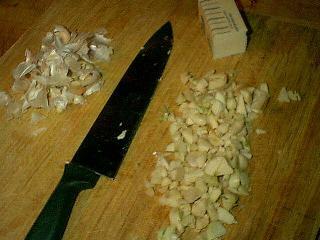 While all of that is happening, peel and chop as much garlic as you would like. You can use one clove, or a whole head like I did. 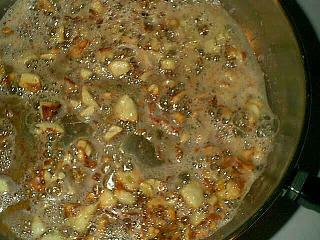 Saute the garlic in 1/2 stick of butter until beginning to brown. Add the fiddles and stir to coat completely with butter, and distribute the garlic. Add 1 cup of white wine, turn on low, cover and braise for five minutes or so. Add 1/2 cup of cream and stir to mix. Fresh ground black pepper can be added in moderation at this point. The fiddles have a delicate flavor and can easily be overpowered. You can serve them as is, add parmesan cheese, crunbled bacon, or seasoned bread crumbs to thicken the sauce to a macaroni and cheese type consistancy. Serve as a side dish, or a sauce for fish, chicken or pork. Try them... You'll like them.